Should I Hire a Digital Marketing Agency or Hire In-House? by Daniel Keever on July 5, 2018 . Digital marketing is quickly emerging as the advertising of the future. Unlike print, radio, and television, the financial barrier to entry is lower and the ROI is always trackable thanks to tools like Google and Facebook’s analytics. As more and more businesses look to get their feet wet with digital marketing, a common question arises: should I hire a digital marketing agency or a new employee? As we mentioned above, one key difference between hiring a digital marketing agency and an in-house employee is that with the agency, you get a package deal of talent. Often times, if you hire an excellent digital marketing specialist in-house, they are likely to be a jack-of-all-trades, master of none. They may be decently familiar with tools like Google Ads, Facebook Ads, SEO best practices, user experience, and social media marketing, but their knowledge of these tools is often not as deep as someone who spends all of their time using a specific tool. For example, your employee might know the basics of SEO, but do they know how to optimize your site for the rapidly emerging market of voice search? Do they know how to make seamless websites that provide exceptional user experience so that Google boosts your rankings? Usually, those would be a stretch for a single employee. 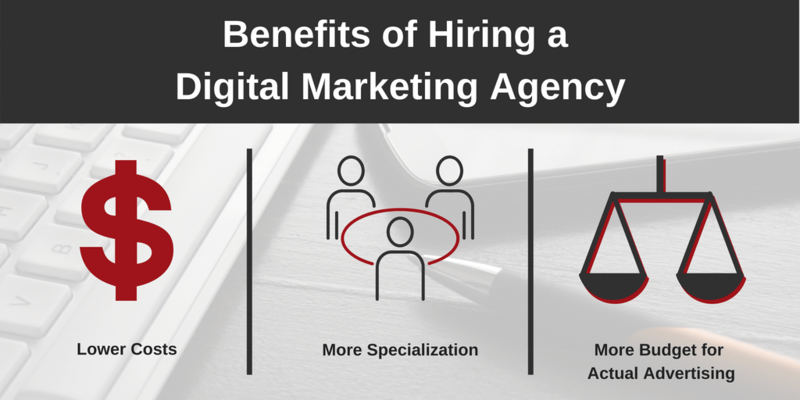 By hiring a digital marketing agency, you can add a digital advertising specialist, an SEO specialist, a user experience specialist, and a social media specialist to your team for less money than it would cost to have an in-house marketer. Depending on the digital marketing agency you might pick, you don’t necessarily have the guarantee that you will get all the attention your digital marketing goals need. If they are distracted with other clients or not well structured, there is a risk that a digital marketing agency won’t provide the work hours you need. A strong full-time employee will be more constantly available than an agency, but again, that is also dependent on the quality of the digital marketing agency you would otherwise bring on to help you. One thing to keep in mind when comparing the two is that you really aren’t getting more work hours out of a single employee. With a single employee, you might get one 40 hour week, but with a team of specialists, you’re more likely to get 4 to 5 8-hour weeks collectively. Ultimately, you’re still getting roughly the same amount of work hours devoted to your marketing. Sometimes, businesses decide to hire in-house because they feel a full-time employee will have a better chance at really understanding the company’s brand, goals, and voice. To an extent, this is true as an individual who spends every day immersed in company culture will pick this up better than a remote employee or team. The best digital marketing agencies overcome this challenge by frequent communication and by listening to your vision and needs, but there’s not a guarantee that they’ll nail it. One final reason business might choose to hire a marketer in-house is that they expect communication to be faster and smoother. In some cases, this is true, but it’s not a guarantee. Some employees may be more disorganized, and a strong digital marketing company will meet and excel all of your communication needs. At the end of the day, the most important number is your ROI. Accordingly, your decision should be made based on what will get you the best ROI and grow your business. Between the two options, determine which approach will result in the most successful advertising efforts. While you can’t know for sure ahead of time what your ROI would be, you can do a cost-benefit analysis that will help you figure out which one is most likely to produce better ROI: Cost of an Agency: Monthly Retainer (see range above) + Advertising Spend Cost of an Employee: Salary + Benefits + Vacation + Advertising Spend Benefit of an Agency: More Specialized Services + More Money For Actual Advertising Benefit of an Employee: Full-time Attention + More Understanding of Company Culture and Brand If you want to learn more about how working with a digital marketing agency looks, get in touch with us! We’d be happy to answer any questions you have about what to expect and what option is best for your business.